As a child I knew I would be an artist. Color held a great fascination for me. A box of 64 Crayolas was the greatest gift I could receive. I arrived at jewelry making after experimenting for years with most every art medium. What continued to hold my interest was metal. It is a malleable material upon which countless numbers of colors can be obtained from applying patinas, enamels and paints or just torchfire. There are countless stones, pearls, woods that can be used. Plus there is something wonderful about moving metal with a hammer. Working with metal, I am given the opportunity to create art that can be seen by others daily. Sculptural jewelry. Wearable art jewelry that can be enjoyed by the wearer and viewer. Jewelry one wears makes a statement about who they are and what they value without saying a word. Giving a glimpse into their personality. This interaction is so different than with two-dimensional art which must be viewed in the privacy of a home. All of my jewelry is hand fabricated, starting with basic sheet metal goods. 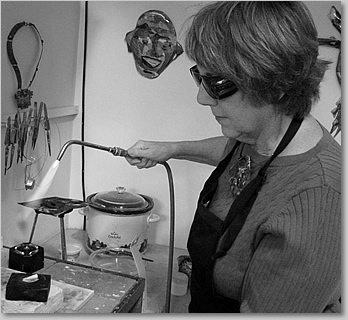 Using torches, anvils, hammers and other tools of the jewelry trade, the metals are bent, shaped, textured & polished. Often patinas are used for coloration and most all of my work is one of a kind. I gain inspiration from architecture, cell structures and even the beach. New ideas are always waiting to become a reality. From 1970 – 1988, my career was that of a professional singer. It was not until after I retired from the entertainment business, that I once again started creating art. As the owner of a floral design company for fifteen years, (1985-2000) I created custom designs for Las Vegas hotel clients as well as for Columbia Motion Pictures. This included airbrushed foamcore display work, window dressing and interior artificial floral designs. Upon moving to Bellingham, Washington in 1997, I set up a home studio and have been working in various mediums since that time. 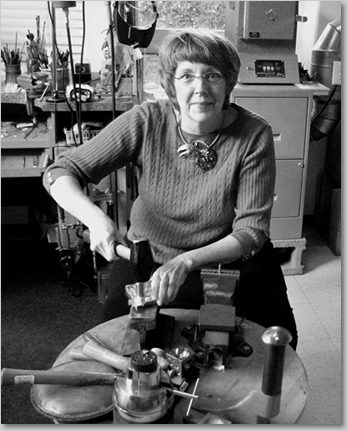 Currently I am a member of SNAG (Society of North American Goldsmiths). © 2019 Liane Redpath. All Rights Reserved.